When I learned from the Women’s Business Development Center that the Goldman Sachs 10,000 Small Businesses program was coming to Chicago, I jumped at the chance to apply for the inaugural class. 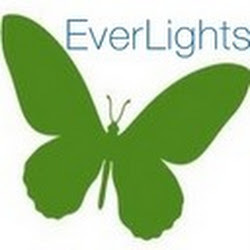 I knew the program would enable me to hone my business skills and learn new strategies to help EverLights become one of the top lamp recycling companies in the U.S.
Of 150 applicants, I was selected to be in the first class of 37 students. I was thrilled but also nervous: going back to school after 15 years seemed a bit daunting, plus I already had a full plate. During the day, I oversee all business operations for Everlights, then head home to feed, bathe and tuck in my three young children. I’m also very involved in several professional organizations. Where would I find the time to attend all the class sessions and do the 2-3 hours of homework required each night for five months? In the end, the chance to learn from leading business experts and other small business owners was too great an opportunity to pass up. I made it work. The experience tested me in ways I couldn’t have imagined. Like most of my classmates, I struggled to better understand the financial aspects of running a business. The educators showed us how to use metrics in a very practical way to determine exactly where the profit centers of the business are, both internally and externally. Another huge benefit was the one-to-one mentoring from a seasoned business consultant. I met with my advisor weekly, and her insights were eye-opening and always on target. For example, I was able to determine very quickly that a new salesperson wasn’t going to be a good fit. Rather than struggle to make it work, we parted ways amicably and I hired a replacement who is working out superbly. Almost immediately, I was able to monitor an increase in sales. Overall sales for first quarter 2012 increased 25 percent, and we’re well on our way to having the most successful year in our 15-year history. We’ve identified and pitched new business opportunities that would enable us to add another full-time team member. And, I’ve investigated the purchase of an office building/warehouse, which I would completely redesign in the most environmentally-friendly way possible. 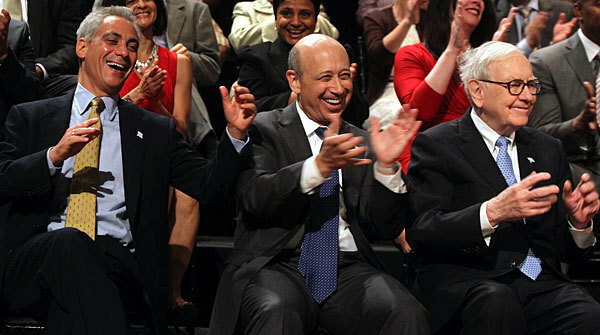 Mayor Rahm Emanuel, Goldman Sachs CEO Lloyd Blankfein and Warren Buffett react during a speech by graduate Dennis Deer during the graduation of the inaugural Chicago class of the 10,000 Small Businesses initiative. 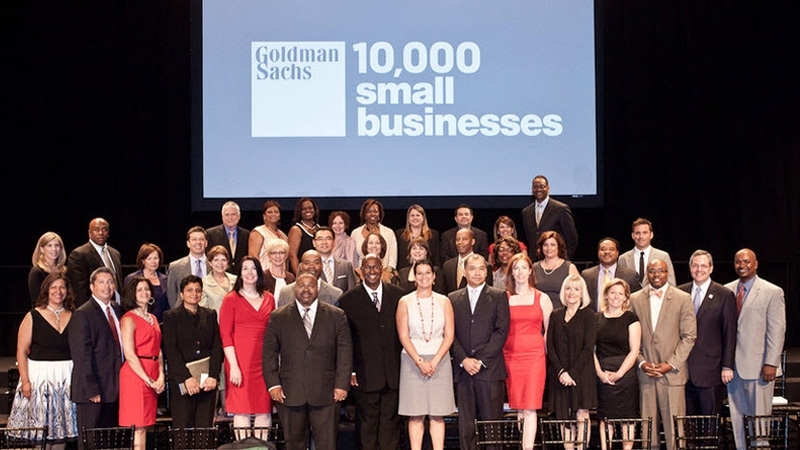 Nominations for the second Chicago Goldman Sachs 10,000 Small Business initiative class, which begins in September, are now open. If you know a small business owner who you believe would benefit from the program, share this link. The application process is extensive and includes a few in-person interviews. However, the benefits of this amazing program far outweigh any fears or inconveniences. I will always be grateful for the opportunity it provided to take my business to the next level. How about you: Did you grow as a business professional from a similar kind of program? Please share your story. This entry was posted in Continuing Education and tagged 000 Small Businesses, Chicago Mayor Rahm Emanuel, EverLights, Goldman Sachs 10, graduation at Malcolm X College, Kelly Aaron Gallagher President EverLights, learn from leading business experts and other small business owners, Lloyd Blankfein, share this link, the first class of 37 students, top lamp recycling companies in the U.S., Warren Buffet, Women’s Business Development Center. Bookmark the permalink.